This Carport Protects Your Car And Your Wallet (Or Purse) At The Same Time! *Please note, the picture is for illustration purposes only, this carport comes in Colour. This YardPro Single Flat Roof Carport is what you need to keep your car under cover and save it from the strong Aussie sun or hail. 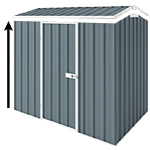 Do u sell roller doors and or can they be attached to a yard pro single carport? Hi, roller doors are not available for carports as it is pre-designed to not have roller doors. Also we sell the whole kit and not just parts, though. I hope this helps and please let us know if you have any questions, thanks. Please confirm the height measurement of 2100 ? - where is that from - length of post? - ground to top or underside of roof?Can the height be raised to get a clear internal height of 2500mm?